This idea has been simmering in my brain for a couple of weeks, refusing to be ignored, so I finally pulled out all the stops and made my dream cupcakes. Surprisingly, they turned out exactly as I had imagined! That almost never happens; usually I just adjust my expectations to meet the reality I’ve created. You could probably see the big smile on my face right now if it wasn’t covered with melted chocolate. 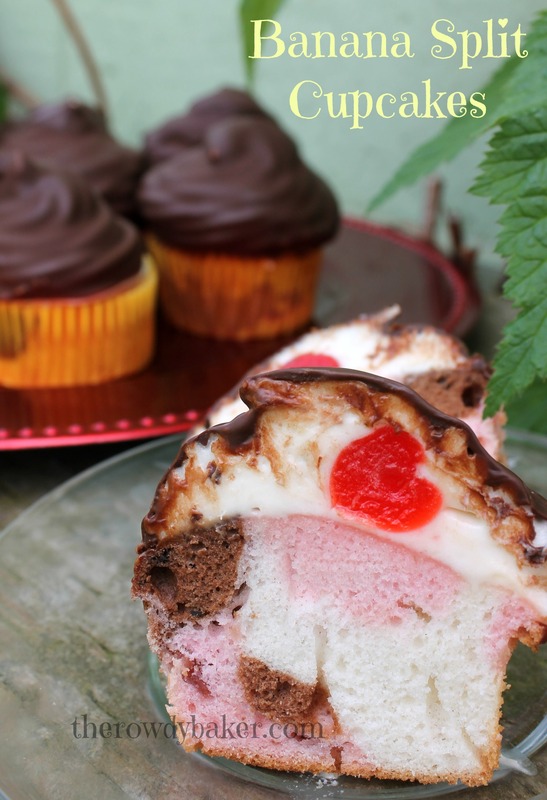 I started with a Neapolitan cupcake, topped it with a cherry surrounded by fresh banana whipped icing, and dipped the top in a simple chocolate shell. Of course I had to sample one. And then there were the ones that I cut in half for photos…couldn’t let those go to waste! I put the uneaten cupcakes in the freezer because I found that they’re even better frozen to remove further temptation. 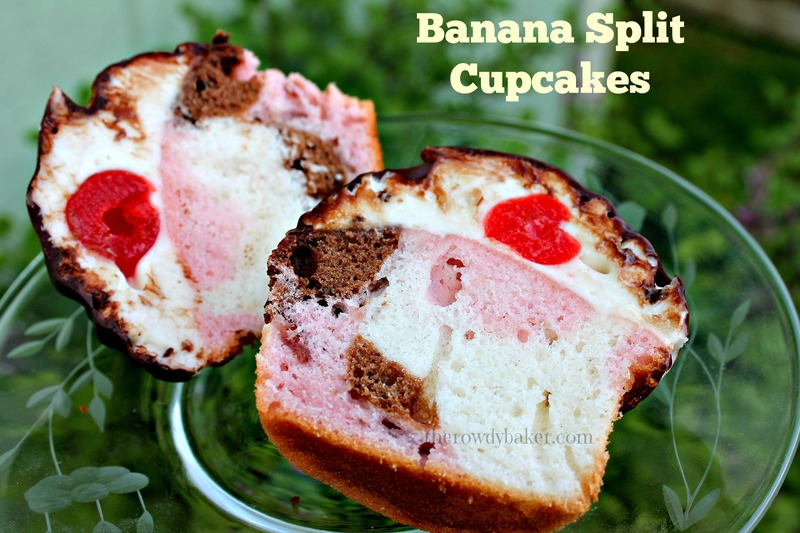 Doing the happy dance, and sharing these Banana Split Cupcakes (aka: HolyCrapWhatHaveIDoneI’mGonnaGain15PoundsThisWeekForSure Cupcakes) with you. I made two batches, one from scratch and one using a boxed mix. Although my recipe is a little more generous, I have to admit the boxed cake worked perfectly, so I’ll leave that decision up to you. If you want to try it from scratch, I used half of a batch of my homemade white cake mix. Otherwise, just use your favorite white cake mix – the kind that uses only egg whites. 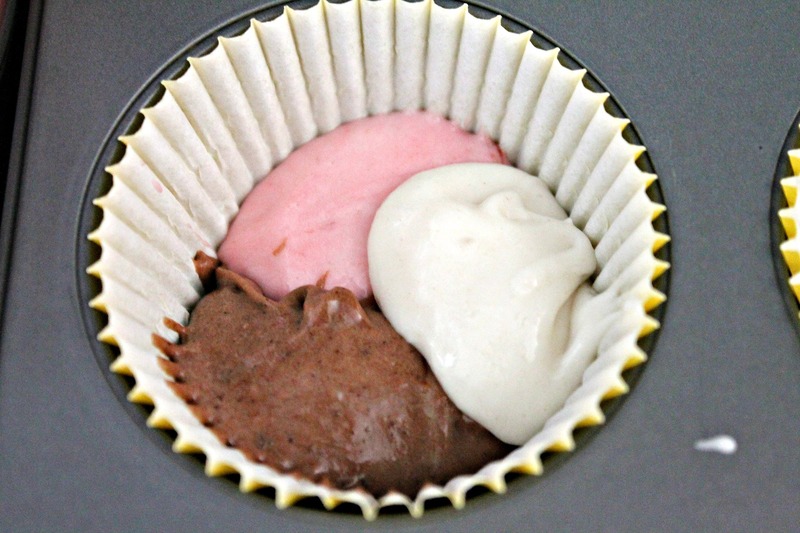 Makes approximately 20 cupcakes if you're using a boxed mix (I know the box says 24, but those are pretty wimpy)...more if you use my scratch mix. 2 medium bananas, ripe but not spotty. Cut out any dark spots and mash well. In the first bowl, add the strawberry jam and a couple of drops of food coloring and stir until mixed. In the second bowl, add the cocoa and coffee (or water) and stir until mixed. Add nothing to the third bowl. Bake 20 minutes. 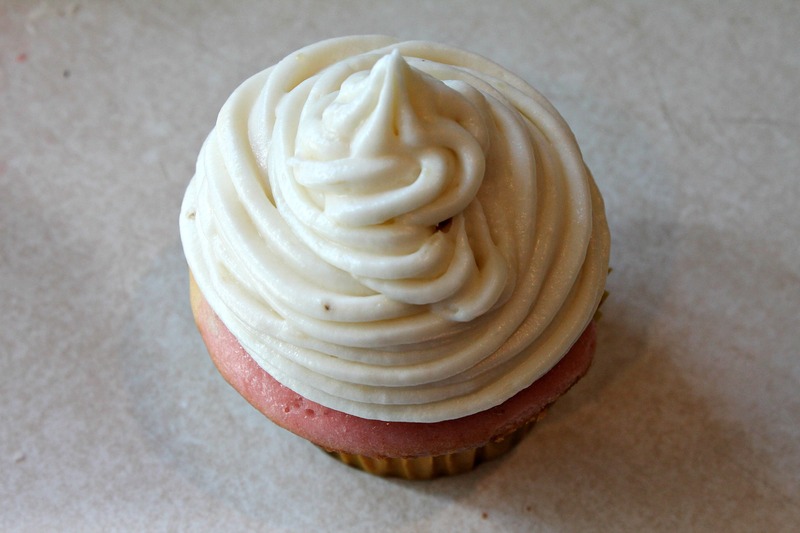 If toothpick comes out clean when inserted into a cupcake, remove from oven and cool completely on rack. In a large bowl, beat together the butter, cream cheese, mashed banana, and vanilla until well mixed - at least 1 minute. Slowly beat in 2 pounds of powdered sugar. When combined, turn speed to medium and beat for 1 minute. Add whipping cream and remaining powdered sugar and beat on medium for 2 minutes, or until thick and fluffy. Pipe a spiral of icing, beginning a little inside the edge of each cupcake top, and ending in the middle. 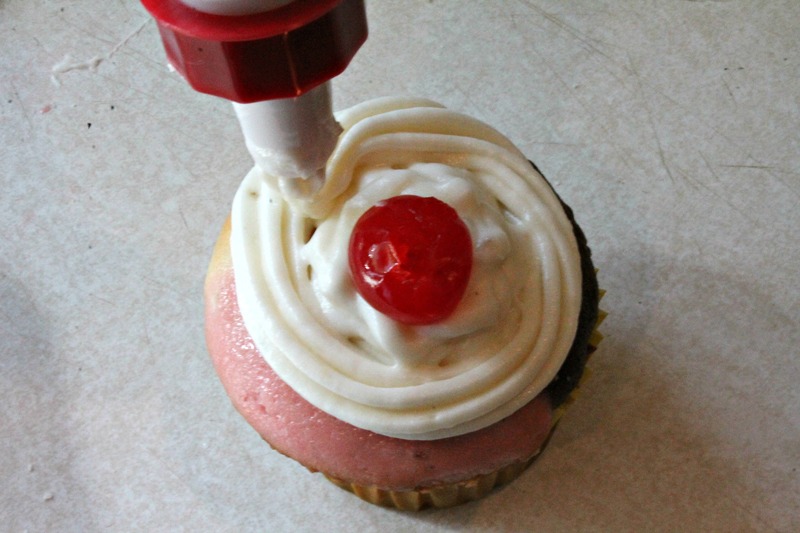 Place cherry in the center of each cupcake. Working from the top, looking straight down at the cupcake, repeat the spiral, this time generously working around the cherry and ending in a peak, completely enclosing the cherry in icing. 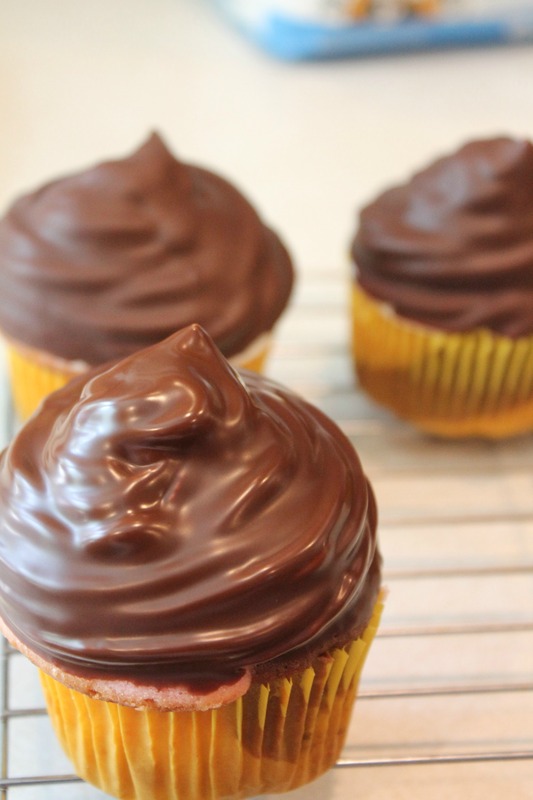 As each cupcake is done, place it on a baking sheet. 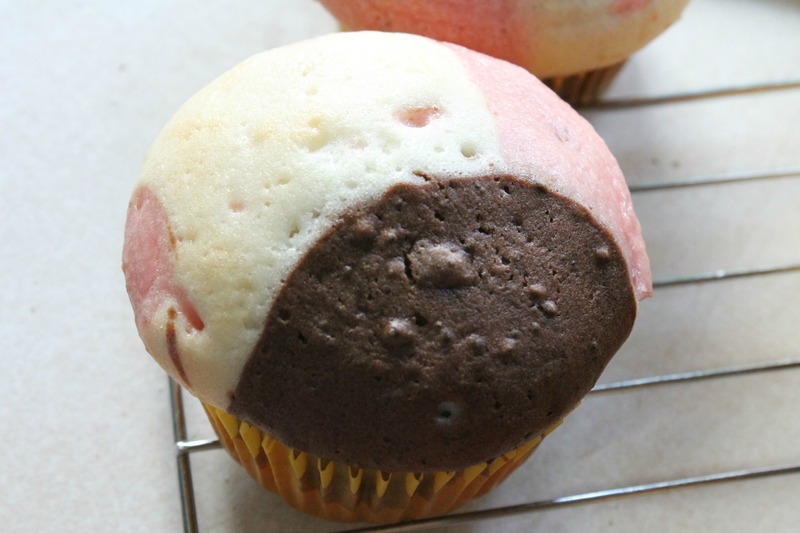 Immediately place cupcakes in freezer for 1 hour. 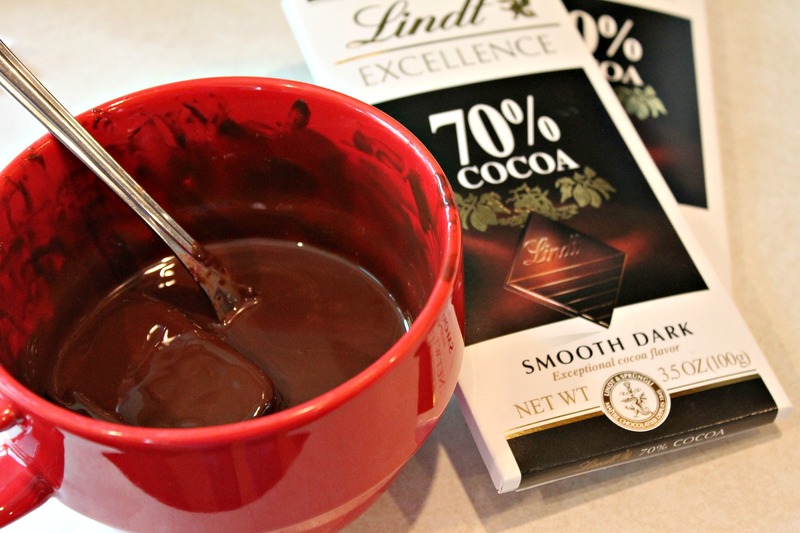 Break chocolate into small pieces. 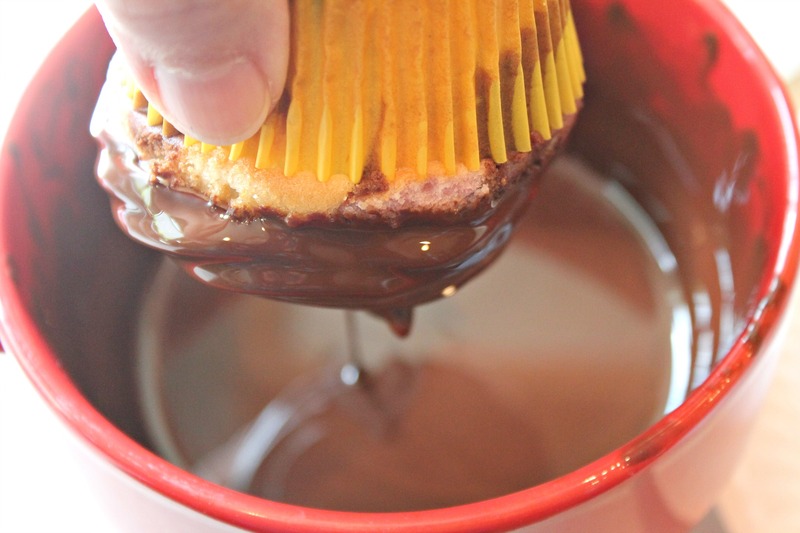 In a cup or small bowl in the microwave (or in small pan on the stove) slowly melt chocolate and coconut oil together. It's important to melt it very slowly at low heat. Serve immediately or keep chilled for best results. 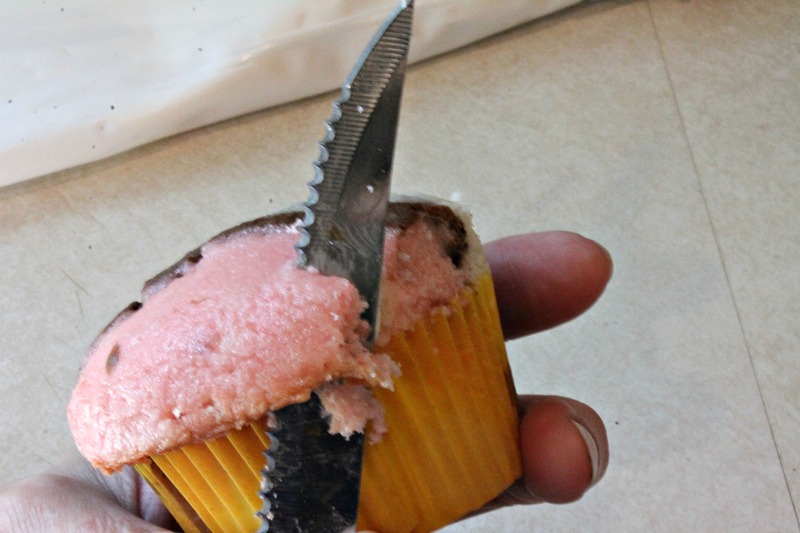 If you get overly generous with the batter and your cupcakes have a “pillow top”, just use a sharp knife to trim the excess. It will get covered with chocolate and no one will know. If the icing is too soft to work with, add a little extra powdered sugar or chill briefly. If it’s too thick, add a little more cream. Dry the cherries in a couple of layers of paper towel before using. First layer. Do it again, varying the color combination. Pipe up and over cherry. Freeze for 1 hour. Melting the chocolate. Go slow! Dip. More than this…all the way to the liner! Drying on the rack. Now’s the time to add sprinkles if you’d like. So. How am I going to top these babies? I honestly don’t think I can. Oh oh – I think I just challenged myself! We’ll see….after gardening season!